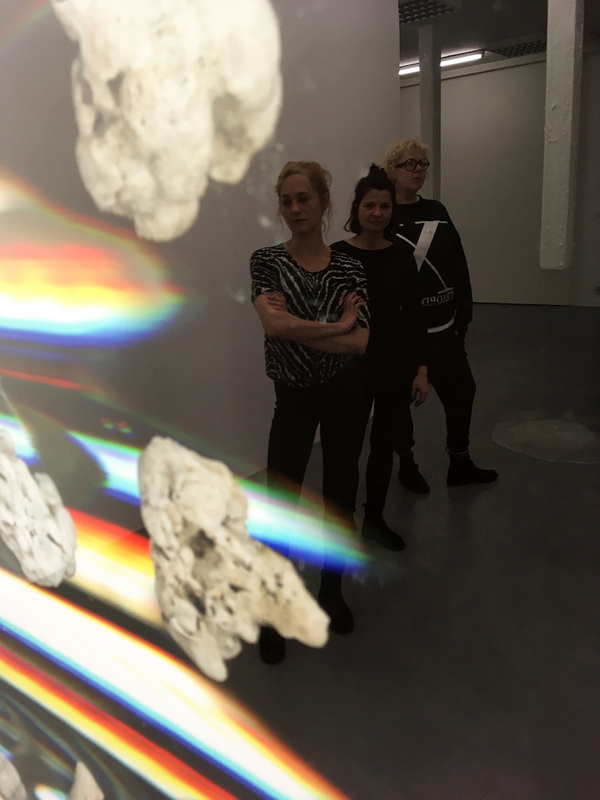 HazMatLab is a Frankfurt-based collective, including the artists Sandra Havlicek, Tina Kohlmann and Katharina Schücke. 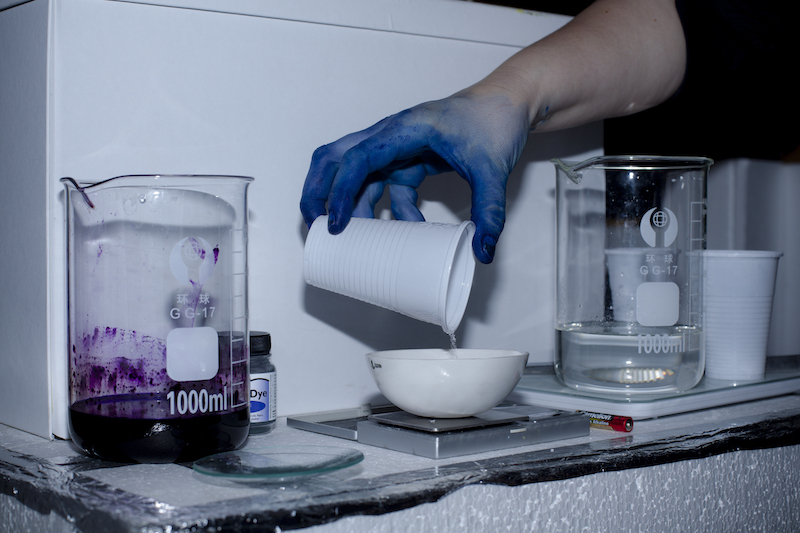 With an emphasis on process-based working practices, the collective is focused on material research and experimentation, trying to push boundaries in cross-sections between chemistry, biology, art and scientific imagination. All three artists studied at Städelschule in Frankfurt with different professors, and after graduating in 2016 they started collaborating as HazMatLab. 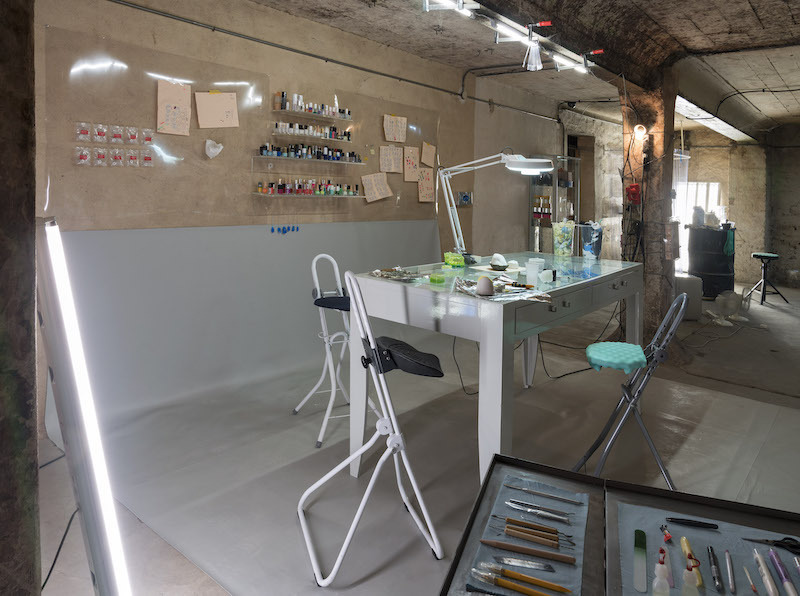 After attending a nail art night in their studio, the artists took me through how they transformed an abandoned room in their building into a hidden lab filled with nail polish smells and curious slimes. This lab is where their work takes place: chemical and alchemical experiments with materials from cosmetics, technology or TCM. We talked about their recent solo exhibition “soothing efficacy” at 8. Salon in Hamburg and the importance of collaborative thinking processes in contemporary art practices. Mine Kaplangı: I would like to start out by asking you for the reference of your collective's name. What does HazMatLab exactly stand for? Katharina Schücke: Hazmat stands for hazardous material. In 2016 we were writing to nail polish labels abroad, asking them for sponsorship to our sculpture "Slumping No1". The answer we got: we would love to support you - but we cannot ship a large amount of nail polish, because it’s easily inflammable, it’s hazmat! We loved that term for dangerous goods and kept it as our name. Sandra Havlicek: We follow a tradition we have created years ago, to meet and do our nails regularly. Our nail-sessions are always obsessive evenings. The table is stuffed with nail polish and tools to create the possibility to express any kind of mood on your nail. Through these sessions we were more and more focusing on technical questions –– the tiny space a nail provides, efficient drying, different tools to do a gradient, compatibility of different polish brands, reuse of worn down designs. Having a well-manicured nail was not our priority. We share this experimental approach as we began to expand our research from nail polish to raw and potentially sculptural materials in the beauty industry in general. MK: When did you start collaborating as a trio? Tina Kohlmann: Although our individual work is quite different, we liked the idea of doing a show together, developing something new together. The process eventually got so important to us, that we decided to continue collaborating. Our studio in the basement became our lab. It had a big table in the middle, while everything else was built around this working station. We added a cooking station for crystal growing, as well as a coating station and so on. Everything was highly functional. After three month we had to move –– our current lab is smaller and only suitable for some experiments on different crystals and for slime making. MK: Last year you joined the residency program at IAa Art Space on Jeju Island in South Korea. Did these experiences influence your practice and research? KS: We came to Jeju Island with the idea of visiting cosmetic labs, learning how they extract the agents from their natural ingredients. We realised how fundamentally cosmetic production is embedded in science and high technology. All processes are kept in secret and unfortunately, we couldn’t even arrange for a site visit. SH: We specifically wanted to work on Jeju-Island, because the main ingredients of "K-Beauty" – Korean Beauty – have their origin on this island. "K-beauty" is now a worldwide phenomenon and no other beauty market knows how to combine efficiency and fun better. It has opened up a new realm of materials for us. Talking about snail mucus, pig collagen, bee venom, black basalt, starfish and jellyfish extract and also the several steps of cleansing rituals as a method. The insanity "K-Beauty" implies feels familiar and challenging at the same time. We wanted to touch all of these raw materials and study them in our lab. KS: Jeju is a great island, with legends on their rich natural environment, amazing seafood and sweets. The staff at IAa was supportive, as we were basically busy 24/7. It was a very productive residency. We got cosmetic products like masks, sheet mask, lotions, tools to use for facial cleaning and more. Playing around with it in the studio, we decided to go out in nature to collect the actual ingredients of those products, such as basalt, corals, algae, rice or jellyfish. We learned how to do photogrammetric scans, so we could take all that material as digital 3D data back to Frankfurt. 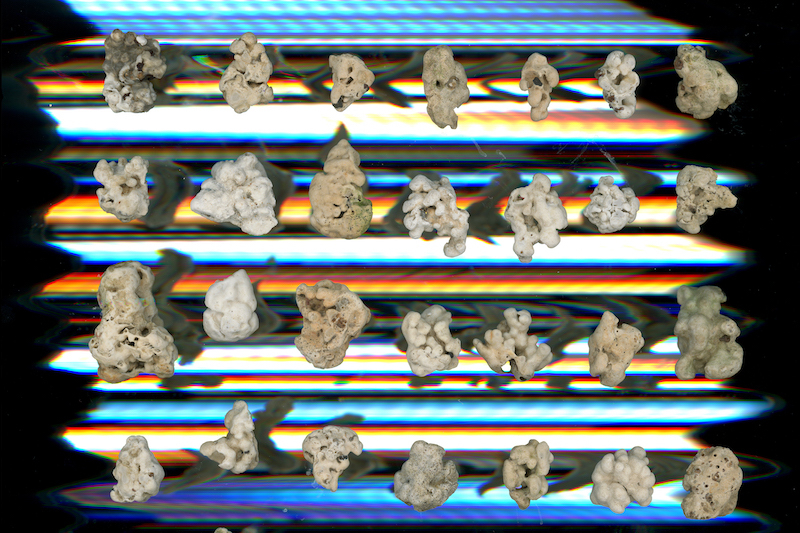 We also worked with a scanner on the highest resolution to be able to enlarge material without a microscope, to study the materials own quality, structure and so on. TK: In Frankfurt it can be difficult to find the time to develop new ideas. Three people with three different schedules can be hard to combine. In the residency, instead, we really went for it –– it was an intense time. At IAa they have an apartment and a super nice studio set up in the city centre. Until then we worked mostly sculptural, on Jeju though, everything was a bit different and we brought back a lot of data instead of sculptures. It was a new way of working for us, a little bit outside of the box. MK: I assume most of this research shaped the exhibition "soothing efficacy" that you had recently at 8.Salon in Hamburg? KS: Yes. „soothing efficacy“ is a term from a Korean Beauty company that describes one of their cosmetic product goals. In the exhibition, we show our intermediate state of research in K-Beauty raw materials in the form of a large-scale photograph titled „Hero Ingredient (Corals)“. The extensive installation „Eco Soul Super Slim“ is a sculptural approach towards methods like soothing, slumping and layering. Taking the title of the exhibition literal, we have developed a recipe for slime to coat ten plinths that are hanging from the ceiling. 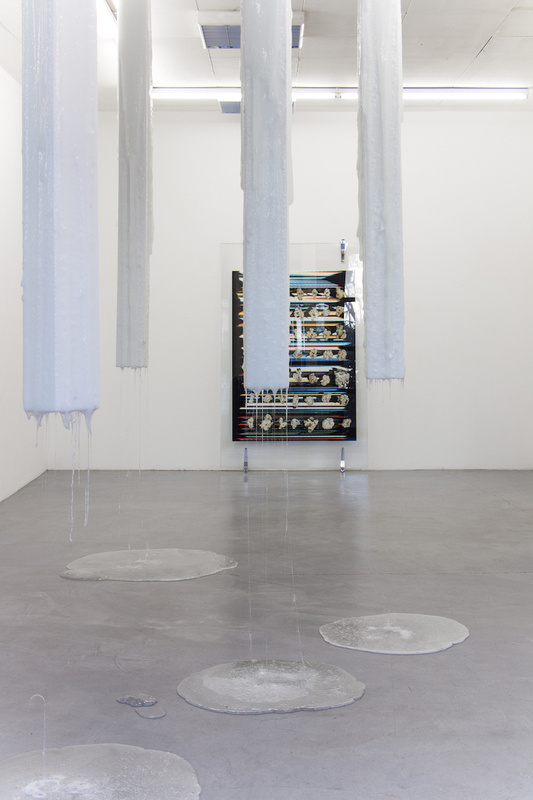 The slime is dripping down steadily and spreading slowly onto the gallery floor. For the object „Slumping No.1“ we have used another cosmetic product as sculptural material, adding layer after layer of nail polish the object is grown to over 1500 layers so far. SH: As Tina mentioned earlier, on Jeju we decided to transform our research and the materials we collected into a pile of digital scans that we could work with. We now have a huge archive of different scans. The work "Hero Ingredient (Corals)" is the prototype of a series of six, which shows a collection of raw materials used in K-Beauty. It’s mounted between two large glass panes, like an enlarged microscope slide, it's just pressed together by 4 clips. It took us a while to create this specific format. Although experts advised us against it, this experiment worked out super well! In "soothing efficacy", we show our on-going interest in materials gathered from the beauty industry and materials that don’t want to be formed, like our homemade slime. MK: You are creating spaces that are not familiar to our everyday lives, and although these spaces are structured as installations, there is a performative and dynamic element in them. 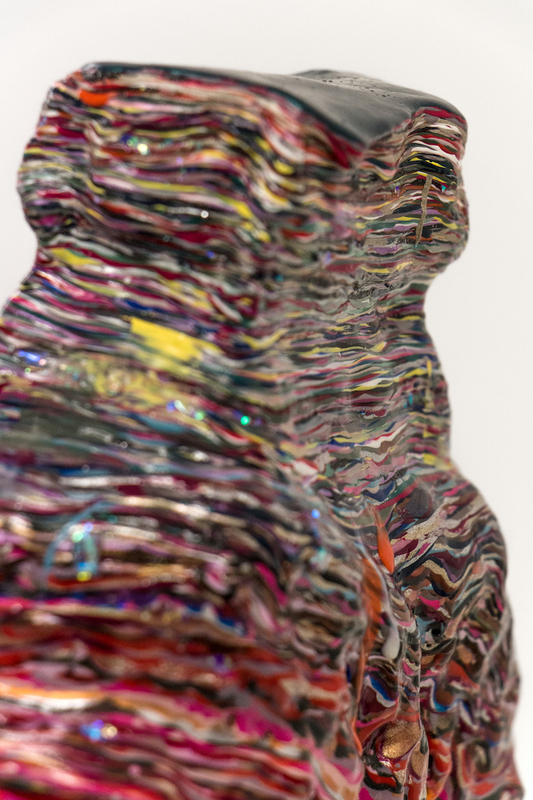 Like the dripping slime, moving colours in print images and of course the unbalanced position of the nail polish sculptures… How would you describe the relations between the media you choose and the concepts of your works and exhibitions? SH: The medium plays a very active role in our work. And probably it is the autonomous behaviour of the materials that adds a performative feeling for you to our work. TK: Slime just has its own mind. We try to control it, but in the end, it just does what it wants –– which is great. A big part of our work is this surprise moment of the unexpected. We expect the unexpected and then see, if we can handle it. I think it also helps not to have a super clear image in your head about what you want to create. KS: We love to think of the material as the fourth mind in our collaboration. We definitely work with it rather than make something out of it. It’s allowed free bent, it might grow out of shape –– or not. It may overwhelm its origin and provoke with new meaning. SH: I think the important background is our lab, where we set the structure for experimental strategies from the very beginning. Our lab is the basis: it changes depending on how and where we work, but it's always an empty space, setting up a structure and yet open to any kind of coincidence that will improve the lab. Basically, we set a frame and let the material move within that frame. Then we start again. Until we – the material and us – defined a form. 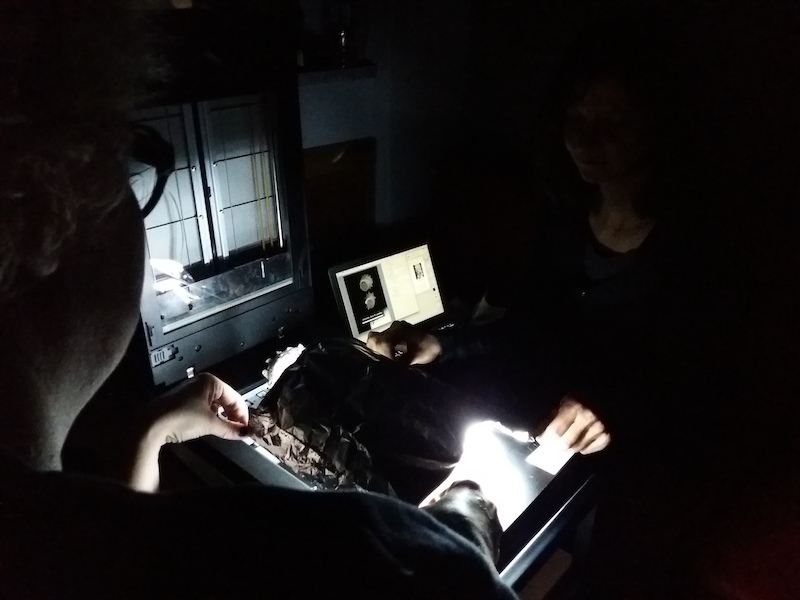 MK: The first time I visited your studio, Donna Haraway's book "Staying with the Trouble Making Kin in the Chthuluce" was placed on your light table. After reading a few chapters I couldn’t stop thinking about how its chapter "Sympoiesis: Symbiogenesis and the Lively Arts of Staying with the Trouble" relates to your art-science practice. How do you think your practice and concept of making art is related to Haraway’s recent studies? KS: This quote from the book could describe our approach: „A model is like a miniature cosmos, in which a biologically curious Alice in Wonderland can have tea with the Red Queen and ask how this world works, even as she is worked by the complex-enough, simple-enough world." I think we approach her visionary proposal to make kin, to relate symbiotically, her idea of response-ability in our artwork in a way that we often work in an open process. SH: I think it is HOW we do works connects us to Donna Haraway's theories. She characterises terms like “sympoietical”, “tentacular thinking” and “response-ability”, which make much sense to describe our work. "Sympoietical" –– because we work in a symbiotic relationship with the material. “Tentacular thinking” –– Haraway relates "to the Latin 'tentaculum', meaning 'feeler', and 'tentare', meaning 'to feel' and 'to try'." The three of us work through feeling and trying, the feelers reappear in our work through the nail, the fingertip, the squid, the chicken feet. "Response-ability" –– Haraway contrasts with responsibility: she establishes an ethical principle for those unable to articulate their views through a rational, human voice, like animals, children and plants. Perhaps one can draw a parallel to our way of working with all senses, without a preconceived principle, while the outcome remains open. This is how we create a basis to enable a form of "response-ability". It is kind of a driving force in our artistic practice. TK: ... especially the slime evokes certain emotions, which make it easy to connect with the work. These associations always fascinated us. The slimier, the better. The process of slime making is exhausting and also quite hilarious. I think people get that when they are in an exhibition. KS: We get extremely excited while experimenting and have lot's of fun. Perhaps it is attached to the material. SH: Besides the unconventional contents and materials we address, we employ directness. 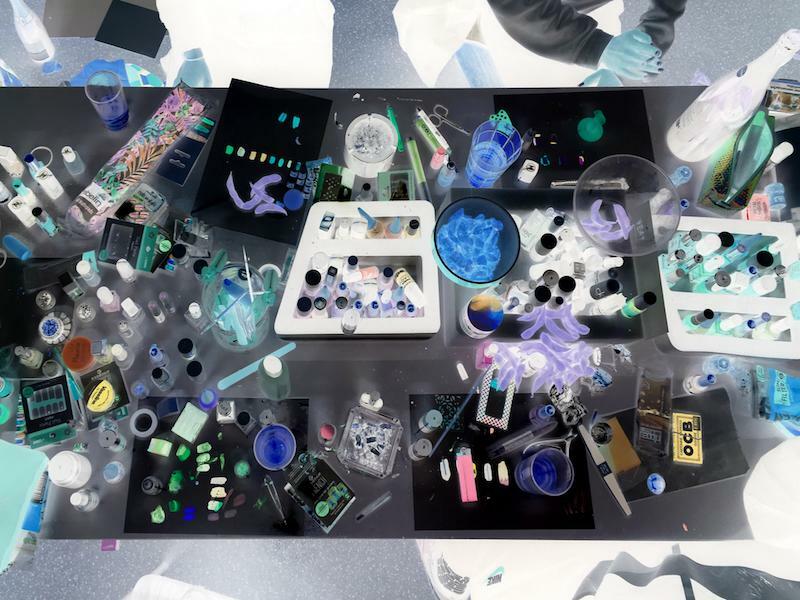 Sculptures combining casts of chicken feet and 99,99% pure bismuth, or a plinth that is overgrown by crystals, the lab, materials like nail polish and green tea mochi, are both - serious and offbeat. MK: So you don't experiment through a set of rules, such as in science, but you follow the freedom of collective intuition thinking manifesting forms in your practice? KS: I have the impression that collective work is often misunderstood, because common knowledge regards the artist as a singular brain and author. We were told once that the work of HazMatLab is unsellable, because it lacks this one clear identity. If we have a manifest it’s based on trust: the process comes instinctively. SH: I totally agree. A collective is a fragile construct: there are more uncontrollable moments than working on your own. The uncertainty, which constitutes what we do, also implies failure. MK: What are you working on at the moment? KS: A new polish mountain is in the making –– for two years we apply layer after layer of nail polish, it’s over 2000 layers now. We experiment with UV light to decrease drying time...because we want to try out what will happen if we work with nail polish on a larger scale. SH: We’re also continuing our research about new lab-equipment, like cooking tools and professional mixing machines. Producing a larger amount of slime by hand is a lot of fun, but also hard muscle work. We liked the idea that we have machines running all day long producing slime for us 24/7. We want our own slime-factory! We also started to think about spatial questions for our upcoming group show “creating a ‘we’” at Basis Frankfurt. It will take place from August to September 2019, together with the artists Daniel Stubenvoll, Olga Cerkasova and Giuletta Ockenfuss. We plan to set up a spatial dramaturgy, for which we will start experimenting with different light situations. TK: In China we made a sculpture out of grass jelly, which is a popular dessert with cooling effects and therefore especially nice during a hot summer. We got some of the raw material, dried leaves called "Platostoma palustre" to experiment with it and make another jelly sculpture from it. The first one collapsed after thirty minutes –– it was just too wobbly.